Home > Starter’s Guide > How to pay your application fees? ACASC has several mean by which they can receive money from applicants. When you are ready to make a payment to ACASC please make sure you speak to a representative and know the most suitable and convenient way to send the money to ACASC. 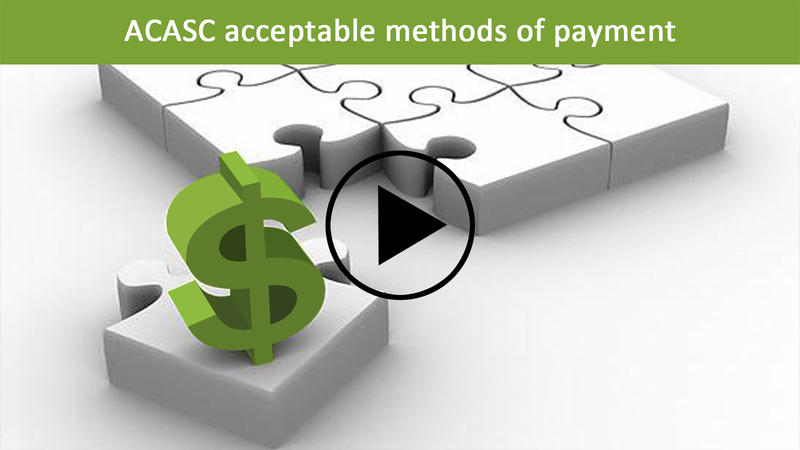 ACASC offers the following six types of payment method. Each applicant is required to use any one of these payment methods. An application will only be processed after payment has been confirmed and verified. All payments must be made strictly through the accounts displayed on this website. Payments to other accounts will not be accepted. No agent has been authorized to receive money on behalf of ACASC. Confirm every information from us before you proceed. PayPal is a safe, easy, and convenient way to transfer money online. Visit the PayPal website to make the transactions. Alipay is an online method of transferring money similar to PayPal. It's widely used in China. Please visit the Alipay website to make the transactions. If you are in China or you have a friend in China, you can pay your application fee in RMB through a Chinese bank. Please take note of the following bank information in Chinese when you or your friend goes to the bank. It usually takes 2-3 working days for the banking system to confirm the payment. Remember to access your application and upload a photocopy of your bank receipt, otherwise, ACASC will not be able to confirm your payment. Applicants overseas can pay their application fee in USD through this method of payment. Kindly add your passport number to the application when transferring the money. It takes 4-7 days for the banking system to confirm an overseas payment. Kindly access your application and upload a copy of the payment receipt, otherwise, ACASC will not be able to confirm your payment. Applicants who cannot transfer money using the payment methods mentioned above are recommended to use the Western Union. You can visit the western union website to send the money online, or you can visit any western union outlet to send the money. After making the payment, Kindly visit your application and upload a copy of the receipt with the MTCN clearly stated on it. ACASC will verify the information before processing your application. Money Gram is similar to Western Union. You can visit any money gram outlet to send the money. After making the payment, Kindly visit your application and upload a copy of the receipt with the reference number clearly stated on it. ACASC will verify the information before processing your application.